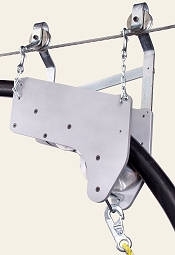 The Roller Type Aerial Cable Guide is used to guide and straighten cables as they are pulled into a lashing position from a stationary or moving cable reel. With its three sheaves to guide cable with minimum friction, this is the best tool you can use when handling especially heavy cable, or when using an aerial basket for "drive-off" lashing. The guide rides along the strand on a roller bearing for smooth movement. A built in grip prevents back rolling during span transfers. Also included with the guide is a safety chain to prevent the guide from coming off the strand. You can connect our Three Roller Cable Guide to the front of a J2 Lasher* equipped with a Hitch Weldment, or to a F, J, or J2 Lasher with a Hitch Field Kit. Guide attaches to front of J2 Lasher gear housing via an optional hitch weldment affixed to the lasher. *Only J2 Lashers with Serial #91-0001 or higher are factory ready equipped with a Hitch Weldment. All other J2 Lashers should be retro-fitted with a Hitch Field Kit.